Toebbe’s collages and paintings promise to leave the viewers the space to draw their own conclusions. 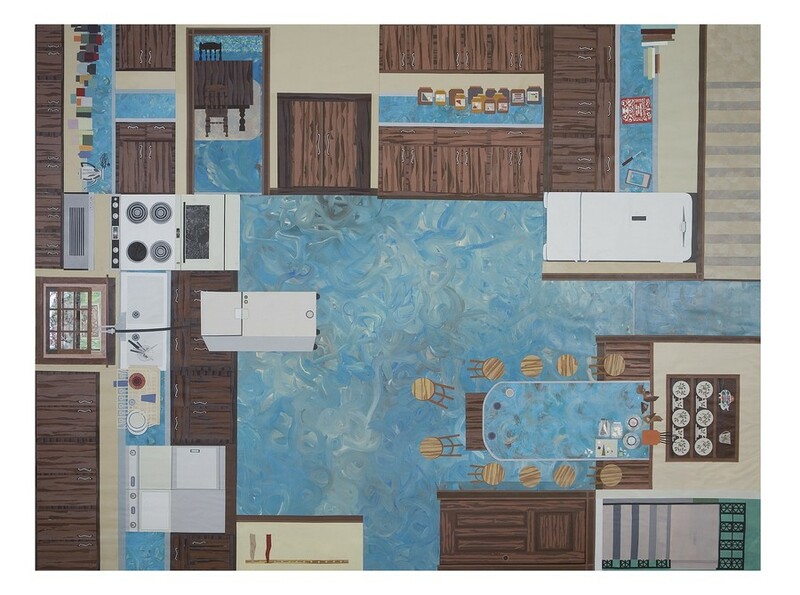 What appears to be a small apartment blueprint hanging on the wall in the MCA turns out to be a meticulous and detailed collage of a kitchen upon closer inspection. The use of everyday subjects, vivid variation of color, and the unexpected materiality of the collage convey a certain naïveté that gives the viewer the sensation of vision filtered through a kaleidoscope. The piece is a good example of Ann Toebbe’s notion of domesticity, reconstructed from her own memories and the stories of several generations of women in her family. The exhibition at the Museum of Contemporary Art, New Artists/New Work: Ann Toebbe, is part of an ongoing series that features up-and-coming artists. Ann Toebbe, who has taught painting and drawing at the School of the Art Institute of Chicago, Northwestern University, and Columbia College, is a Chicago-based artist whose artistic production has gained increasing traction within Chicago’s art community. Her unusual medium and ambiguous subject is central to the MCA show. Although the exhibition features only three large-scale pieces from her recent work, “The Doctor’s Wife,” “The Grocer’s Wife,” and “The Photo Engraver’s Wife,” these works represent an extended cohesion of her earlier experiments with medium, perspective, and color. An introduction to Toebbe and the objective behind her overall collection at the entrance of the room stands in contrast to the utter lack of explanations beside each work. The paintings and collages stand alone on the bleak white wall, and this austerity heightens the ambiguity that is such a fixture of her art. The viewer, upon entering the exhibit, is surrounded by art on all three sides—creating a disorienting effect that mirrors the strangeness of the pieces. The pictorial field of “The Doctor’s Wife” is divided into two: the kitchen on the left side, and the garden on the right. Toebbe employs circular paint strokes to depict the green of the grass. This fluidity, however, is punctuated by the obvious use of collage to render the jars on the counter and the vegetables in the sink. The alarming awkwardness of the materiality is exacerbated by the fractured style of the piece. The two doors on the upper half of the frame are placed so that they directly face the viewer; however the table at the center of the room forces the viewer to assume a top-down perspective. As the viewer adjusts his perception to accommodate the conflicting viewpoints, he is challenged to reconfigure the angle from which he makes sense of this domestic scene. Toebbe draws inspiration for her work from conversations with her mother, mother-in-law, and stepmother-in-law, who told her stories of domestic life from the 1940s and 50s. Toebbe adds her own childhood memories of home and her newfound awareness since becoming a mother of what the domestic space entails to the narrative begun by past generations. The fractured nature of the pieces actually works because such a multitude of individuals, stories, and time frames go into the production of a single image. There is no singular framework that can make sense of a place that contains such different and conflicting significations, and Toebbe’s collages and paintings promise to leave the viewers the space to draw their own conclusions.